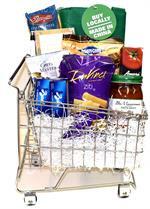 This clever basket, packed in a miniature metal shopping cart, makes for a great housewarming gift. It's packed with all the essentials needed to make a meal or two, pad & pen for list-making, and a little motivation to venture forth on a pantry-stocking trip with a pithy canvas shopping tote "Buy Locally / Made in China". Reusable Canvas Shopping Tote with fun message.